Africa is facing a growing crisis of water scarcity. By 2025, more than half of the continent’s countries will face water scarcity or stress. Phenomena such as climate change, sustained demographic growth, rapid urbanization and industrialization all place pressure on governments to adopt more sustainable water management practices and plans. 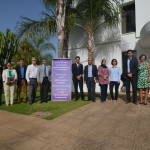 The United States Agency for International Development (USAID), The United Nations Industrial Development Organization (UNIDO), FESTO Didactic, EON Reality, Morocco’s State Secretariat in charge of Vocational Training, and Morocco’s National Office for Drinking Water and Electricity (ONEE) have joined forces to contribute towards solving this challenge and started the H2O Maghreb training hub in April 2017. H2O Maghreb is a public-private development partnership initiative aiming to improve industrial and municipal water management practices in Morocco in an inclusive and sustainable way, notably by addressing the lack of knowledge on skills gaps and employment opportunities in the sector, the lack of industry professionals with skills in the latest water and waste water management technologies, and the lack of replication of best practices. The project focuses on the development of new curricula for water and wastewater management-related skills. These curricula take a holistic approach toward wastewater management, so that future H2O Maghreb graduates gain theoretical knowledge and hands-on experience that will allow them to respond to various and complex needs across municipalities, industries or agricultural sectors. 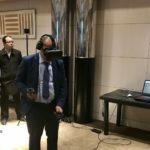 Furthermore, the H2O Maghreb training hub includes the most recent technological innovations, such as adaptive virtual reality and automation technology, which will be delivered at a demonstration and training hub within ONEE’s International Institute of Water and Sanitation (IEA) in Rabat. 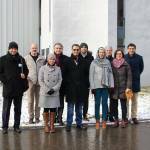 On March 13th, all project partners were brought together for an inauguration of the program’s newly operational training facilities at the IEA premises. Trainers presented the training to the participants, while H2O’s first batch of students, who began their training in November 2018 and will finish in April 2019, used the opportunity to demonstrate their newly acquired skills. “USAID is delighted to support this program to improve water and waste management practices. We are equally delighted that this program will enhance youth employability in Morocco.” noted Brooke Isham, USAID Mission Director in Rabat. The H2O Maghreb project is being implemented over a period of two years and is linked to UNIDO’s global knowledge-sharing platform, the Learning and Knowledge Development Facility (LKDF). The project is intended as a proof-of-concept with the idea to replicate the concept and training program in other countries in the MENA region as well as Sub-Saharan Africa.